For the civil use of this facility after 1977, see Big Spring McMahon-Wrinkle Airport. 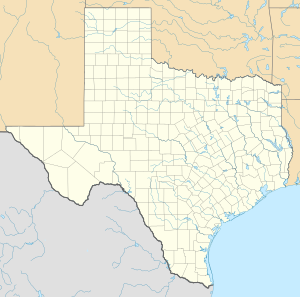 Webb Air Force Base (IATA: BGS), previously named Big Spring Air Force Base, was a United States Air Force facility of the Air Training Command that operated from 1951 to 1977 in West Texas within the current city limits of Big Spring. Webb AFB was a major undergraduate pilot training (UPT) facility for the Air Force, and by 1969, almost 9,000 pilots had been trained at Webb. The last operational wing at Webb AFB was the 78th Flying Training Wing. The facility first was used by the United States Army Air Forces as Big Spring Army Air Field, opening on 28 April 1942 as part of the Central Flying Training Command. Activated on 26 June 1942, the mission of Big Spring AAF was to train aviation cadets in high-altitude precision bombing as bombardiers. It was one of the "West Texas Bombardier Quadrangle" schools of the Army Air Forces Training Command. The other bases in the quad were Midland Army Airfield, San Angelo Army Airfield, and Childress Army Airfield. The base was declared surplus and was turned over to the War Assets Administration after being closed. It eventually reverted to city control, and it served as the Big Spring Municipal Airport for six years. The facility was brought back into service as a primary training installation because of the Korean War and the need for additional pilots. Four months later, on 18 May 1952, ATC changed the name of Big Spring Webb Air Force Base to memorialize 1st Lieutenant James L. Webb, a Big Spring native and World War II combat pilot in Europe, who was killed in a mishap off the Japanese coast flying a P-51 Mustang in 1949 during a training mission. Instruction of the first class began in April 1952. The initial mission of the 3560th PTW was basic, single-engine flight training. The wing was equipped with 37 T-28 Trojan propeller and 28 T-33 Shooting Star jet trainers. The base population soon passed 2,000. With the end of the Korean War, in 1954 ATC reduced its basic single-engine pilot schools from seven to five, this saw the number of students at Webb remain basically the same as the number of new pilots needed was reduced. The propeller-driven T-28 was phased out in 1956 and converted all training to the jet-powered T-33. In 1956, the Air Defense Command's 331st Fighter-Interceptor Squadron was transferred to Webb AGB from Stewart AFB, New York to defend the southern United States border on air intercept missions as part of the Central Air Defense Force. Originally flying the F-86D Sabre, the squadron upgraded to the F-102 Delta Dagger in 1960, then transitioned to the F-104 Starfighter in 1963. In March 1967, the 331st was redesignated the 4760th Combat Crew Training Squadron and charged with training Royal Jordanian Air Force students on F-104s. It was inactivated on 1 October 1967 when the Jordanians were recalled because of the war with Israel in the summer of 1967. By the mid-1970s, the end of the Vietnam War, the associated financial costs of that conflict and related cuts in USAF force structure and future defense budgets meant a marked decrease in the need for Air Force pilots. One of the major issues facing the ATC commander and his staff during 1976 was the prospect of closing two UPT bases. Rather than reduce training production at all seven locations, ATC officials believed it to be more economical to close two bases. So it was on 11 March 1976 that the Secretary of the Air Force proposed closing several military installations, to include UPT bases Craig AFB, Alabama and Webb AFB, Texas. At Webb AFB, the last two pilot training classes completed course work on 30 August 1977, and fixed wing qualification training ended on 1 September 1977. Air Training Command inactivated the 78th Flying Training Wing at Webb AFB on 30 September 1977, although the 78 FTW was subsequently reactivated as the 78th Air Base Wing (78 ABW) at Robins AFB, Georgia, a role it continues in today. The two installations, Webb and Craig were placed in caretaker status the following day. The training previously provided by Webb AFB was moved to Sheppard AFB, Texas, where the first class began on 30 June in what would eventually become Euro-NATO Joint Jet Pilot Training (ENJJPT). Webb AFB was turned over to the General Services Agency for disposal on 1 January 1978 and the property later turned over to the Big Spring Industrial Park. The airfield and flight line was converted to an uncontrolled/UNICOM-only general aviation airport renamed Big Spring McMahon-Wrinkle Airport, serving the City of Big Spring. In addition, three units of the Big Spring Correctional Center (a federal prison privately operated by Cornell Companies) are located on the base grounds (as well as FCI Big Spring, which is a separate facility and operated directly by the Federal Bureau of Prisons). ^ "Big Spring-Webb AFB, TX profile - Aviation Safety Network". aviation-safety.net. Retrieved 20 October 2017. ^ "USAFHRA Document 00169712". airforcehistoryindex.org. Retrieved 20 October 2017. ^ "USAFHRA Document 00147684". airforcehistoryindex.org. Retrieved 20 October 2017. ^ "USAFHRA Document 00169727". airforcehistoryindex.org. Retrieved 20 October 2017. ^ a b "USAFHRA Document 00487755". airforcehistoryindex.org. Retrieved 20 October 2017. ^ "USAFHRA Document 00461834". airforcehistoryindex.org. Retrieved 20 October 2017. ^ "Squadron Service of the F-102". home.att.net. Archived from the original on 10 December 2008. Retrieved 20 October 2017. ^ "USAFHRA Document 00434488". airforcehistoryindex.org. Retrieved 20 October 2017. ^ "USAFHRA Document 00487794". airforcehistoryindex.org. Retrieved 20 October 2017. Wikimedia Commons has media related to Webb Air Force Base. Wikimedia Commons has media related to Big Spring Army Airfield. Photos of pilot training at Webb AFB in 1953[permanent dead link], History of the 45th Fighter Squadron.